One day one, after a late lunch and siesta, I photographed and hunted a Dove roost 20 minutes from the lodge with Los Laureles lodge manager Aldo Machin and my guide for the week, Pepe. Vowing to shoot only a flat (10 boxes) of shells actually didn't happen. 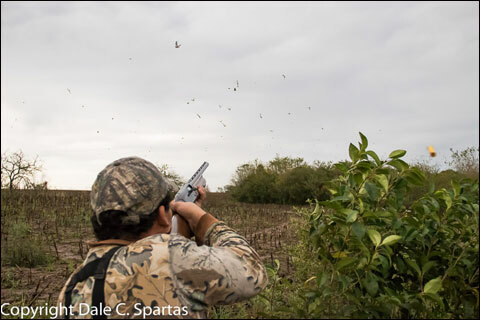 Pepe kept pouring shells into my pocket and more Doves were seen in the first 15 minutes at Los Laureles than I'd seen in 10 years of state-side Dove hunting. 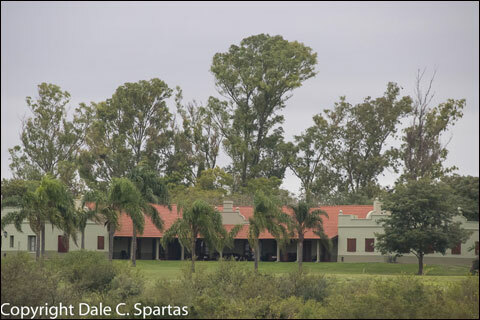 The Los Laureles Lodge sits on a hill above the Parana River surrounded by Dove roost. The lodge is spacious, beautifully appointed and comfortable. Starting slowly with a string of misses due to over leading, I finished strong with 20 Doves falling to 25 shots on my last box using one of their rented semi-automatic shotguns. The hunt was followed by cocktails, a massage, a wonderful grass-fed Argentine beef steak dinner complemented by a delightfully smooth Mendoza Malbec wine and a homemade apple crisp dessert. The next day my good friends Mark and Roselind Travis arrived from the U.S. After a late lunch and brief siesta we headed to a different location in the same roost I’d hunted the day before. Despite the rain the air was full of Eared Doves or E.D.s as we called them. Eared Doves are very similar to Mourning Doves except they have slightly shorter tails and are a bit smaller. 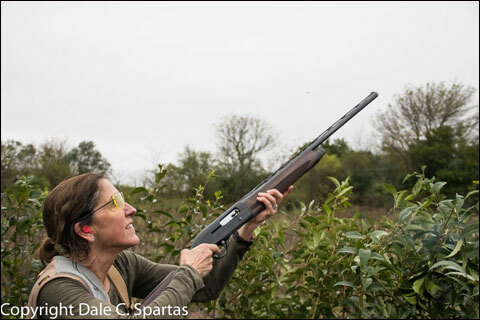 Roselind Travis with a lodge-supplied Beretta semiautomatic shotgun poised and ready to swing on passing doves. Walking through the woods to my blind a barrage of gunfire could be heard as Mark and Roselind were hard at it having the best Dove shoot of their lives. The rain grew harder as the afternoon wore on, and so did the Doves coming to roost and of course so did our shooting. After casing our guns for the day, two 40-pound feed bags of Doves were carted back to the trucks and we returned to the lodge. Mark and Roselind’s ear-to-ear smiles were evidence of a good time had. That evening after cocktails and a celebratory toast by Aldo, we dined on sumptuous Doves cooked to perfection, served with a wonderful farm fresh salad, rice and greens accompanied with several wonderful bottles of Argentine Malbec. Ingredients: Dove breast, garlic, parsley, salt, pepper, cream, cognac and soy sauce. Marinade Doves: garlic, salt, pepper, and parsley 4 to 8 hours. Flambé' with cognac. Once alcohol has burned off remove the breasts to another pan or bowl. Add cream and soy sauce to the pan to make sauce, bringing to low simmer and reduce. Add Doves and sauté in sauce for 1 or 2 minutes. Serve with French fries or polenta and a fresh green salad and a favorable Argentine Malbec. Having elected to hunt Ducks the next morning the wakeup call came early. After several espressos and a light breakfast it was a short 20-minute drive in complete darkness from the lodge to our blinds. It was about 30 minutes before the first hint of light. 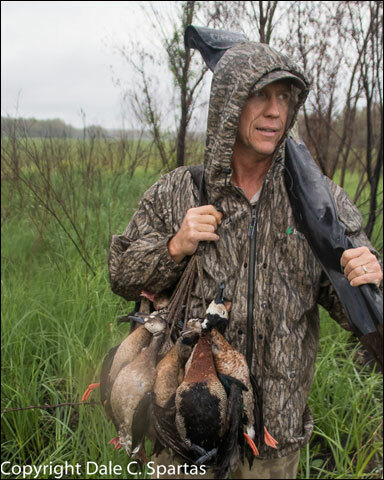 Avid waterfowl and bird hunter Mark Travis with Duck strap of White-Face Whistling Ducks, Ringed Teal and Brazilian Ducks. As often the case in the U.S. several groups of hunters in singles and doubles worked the birds over the decoys before it was light enough to shoot. The first shootable Ducks of the morning were three Brazilian Teal that came in low from behind and got away unscathed. The next pair of Brazilian Teals were not so lucky with one down. The next Duck was a beautiful drake Silver Teal that flew down the pond above the eastern horizon and miraculously folded to my shot. Silver Teal are beautiful Ducks about the size of American Widgeon, with black capped heads and a black mask extending just below their eyes and colorful bright yellow and blue bills. 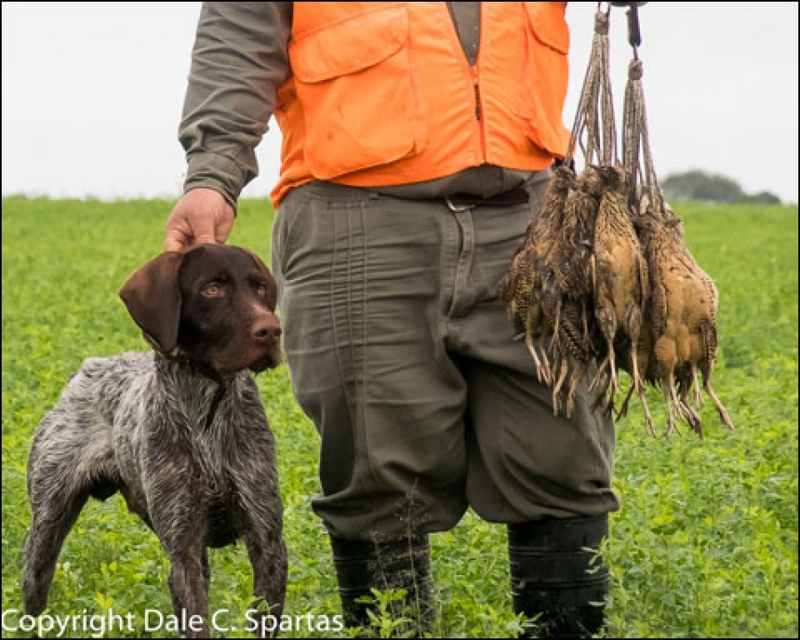 A young and very talented German Wirehaired Pointer named Fox with a limit of Perdiz he trailed, pointed and retrieved. Fox was a delight to hunt over. Mark and Roselind had drawn a hot blind and in turn filled their combined 40-Duck limit along with a couple Snipe in about 90 minutes. Our bag consisted of Ringed Teal (a.k.a. Spotted Wing Teal), Speckled Teal, Brazilian Ducks, Red Shovelers and White-Faced Whistling Ducks. Hen Red Shovelers are very similar to hen Northern Shovelers and Aldo told me White-Face Tree Ducks are Argentina's wariest Duck and difficult to decoy often fly in large flocks. We finished the morning with 50 Ducks, 10 Pigeons and 1 Snipe most of which were retrieved by a talented young German Wirehair named Fox. As it turned out we were hunting in the early part of the season when it’s rather warm and the Duck migration north (that’s right north) had not started yet. Had we arrived a month later and hunted between June and August we were assured we would see many more Ducks in a greater variety of species. In a sky full of Doves the author’s guide Pepe, who could really shoot, picks and centers a flaring Dove. Los Laureles has fabulous Perdiz hunting. We hunted large alfalfa fields and Fox moved 20 to 30 birds a morning. Perdiz remind me of young Pheasants and run like them too and many were worked 100 to 150 yards before holding for point. Once flushed they are fairly easy shooting (not that I didn't miss a few). Perdiz are excellent table fair and present a moist white meat. Los Laureles provides wonderful multi-species hunting for Doves, Pigeons, Ducks and Perdiz plus exciting Golden Dorado fishing all within 10 to 20 minutes from the lodge. Food, lodging and services were par excellence. As the saying goes, I'd go back there in a New York minute.